The highway system in the State of Iowa includes many grade separation structures constructed to provide maximum safety and mobility to road users on intersecting roadways. However, these structures can present possible safety concerns for traffic passing underneath due to close proximity of piers and abutments. Shielding of these potential hazards has been a design consideration for many years. This study examines historical crash experience in the State of Iowa to address the advisability of shielding bridge piers and abutments as well as other structure support elements considering the offset from the traveled way. A survey of nine Midwestern states showed that six states had bridge pier shielding practices consistent with those in Iowa. Data used for the analyses include crash data (2001 to 2007) from the Iowa Department of Transportation (Iowa DOT), the Iowa DOT’s Geographic Information Management System (GIMS) structure and roadway data (2006) obtained from the Office of Transportation Data, and shielding and offset data for the bridges of interest. 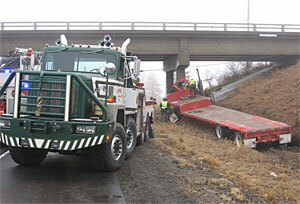 Additionally, original crash reports and the Iowa DOT video log were also utilized as needed. Grade-separated structures over high-speed, multilane divided Interstate and primary highways were selected for analysis, including 566 bridges over roadways with a speed limit of at least 45 mph. Bridges that met the criteria for inclusion in the study were identified for further analysis using crash data. The study also included economic analysis for possible shielding improvement.